It was only a matter of time before Porsche followed its Cayenne SUV with something for executive car buyers seeking the odd thrill. 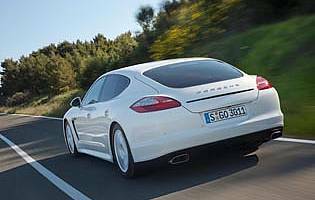 With the Panamera, Porsche offers a four-door, four-seat executive express, complete with choice of turbo power and all wheel drive. Along with a petrol-electric model the circle is complete with a fuel-sipping diesel variant. The Panamera is not a small car. At almost five metres long it's not something that does the supercar 'thing' by half measures. 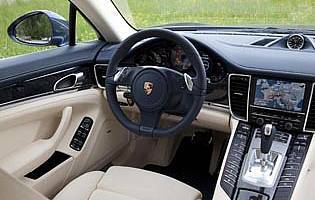 At its original launch, the all-petrol line-up boasted supercar-baiting performance, all-wheel drive and a fancy direct shift gearbox (PDK). On paper, Porsche has succeeded in delivering a 911-like experience for those who want a conventional sports coupe, but one that's more practical than the usual two-door coupe format. With its four-door hatchback layout, the Panamera offers families the chance to have the best of both worlds. Taking this theme to its logical conclusion, it was only a matter of time before a diesel variant appeared. Reading between the lines it wasn't something Porsche had planned, but since the company's absorption into the Volkswagen fold the suitable parts were available. The 3.0-litre, 250 horsepower unit chosen delivers where it counts, with a flat torque curve ensuring fuss-free acceleration and good economy and emissions numbers considering the car's size. 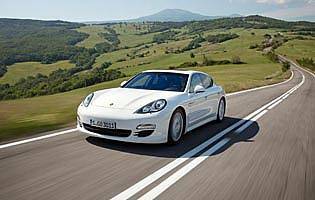 Don't expect Turbo-style performance though - even Porsche is happy to admit that the Panamera Diesel is more grand tourer than supercar. As such, a 700 mile-odd range is promised along with a plush and comfortable cruising attitude. The car will 'do' corners, and displays a level of precision and competence that its rivals cannot match. You just need to work the engine hard to experience it. 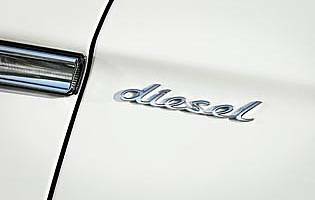 With Porsche expecting its Panamera Diesel to account for around half of all European sales, it would be foolish to dismiss the car on the basis of its modest performance credentials. Viewed as a whole, the car is likely to be a popular choice for executive car drivers seeking a little more excitement, but also keen to save a few pounds in the process. The intimate but comfortable cabin and driver-centric character should help seal the deal.